We’ve been rowing Mirette on the High Wire this week. It is a lovely book about a girl whose mom runs a boardinghouse in Paris. One day the great Bellini comes to stay and Mirette sees him walk on a clothesline in the yard. She becames entranced with the idea of walking the high wire and though Bellini at first won’t teach her, she is not deterred and practices on her own. When Bellini sees her determination, he agrees to take her in as his pupil. We haven’t finished the row. We have some circus fun planned for the coming week, but I wanted to share a bit of it now, as it ties in to the Blog Hop that Leann of Montessori Tidbits is hosting. The book takes place in Paris, France. So first, I printed out some pictures of Euros and French stamps, pulled out the Arc de Triomphe and the Eiffel Tower from our collection of Toob things, and retrieved the French flag Bear made last week at her homeschool class (they were studying the French Revolution and how it affected the colonies) and put these items on a tray for our geography shelf. I talked about France a bit…wishing I had remembered to also sign out Crepes by Suzette to go along with this row. We found France on the map. We remembered that Claude Monet was from France and we admired his paintings on our three-part cards. Our display from our waterlily art project is still up too. Then I made omelets for lunch. We ate them with baguette. And crepes for snack. I used my mother’s recipe (I grew up on crepes, being French Canadian) but was sneaky and added spinach that I processed in the food processor to the batter. The kids have had plenty of omelets and crepes in the past, but Bear delighted in the fact that she was having a French lunch and snack. Stay tuned later this week for the work done with this row. 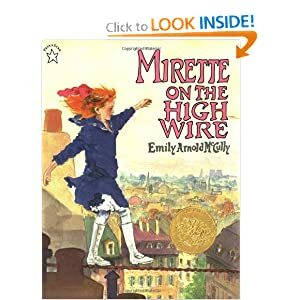 I love Mirette on a High Wire. For some vague reason I think there is a sequel to this book, but that's not seeming right.It'll come to me at some point late in the night…..